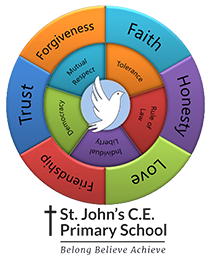 At St. John’s we follow a Christian ethos. We embrace all people at all times. St. John’s is a friendly, fair and respectful environment in which to learn and play. Our ultimate goal is to prepare everyone for a bright future. Well done to Year 1P and 2B with 99.3% attendance this week!